I knew Dr. Jim Dahle for a long time although we have never met in person. He’s an emergency room doctor who also runs The White Coat Investor blog. I often include his blog posts in my weekly digests. Jim is a much more productive blogger than I am. Besides his blog he also has a book, a column in a professional journal, a podcast, a YouTube channel, and a conference. 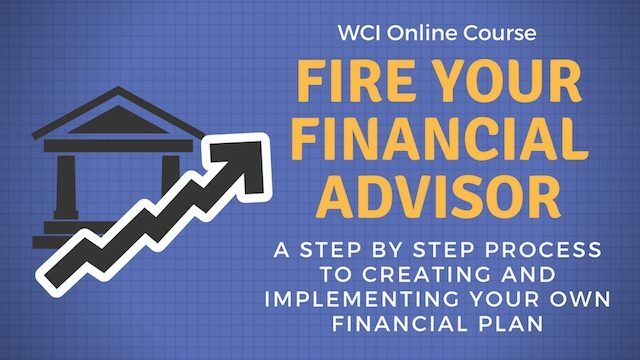 He recently created an online course for personal finance education called Fire Your Financial Advisor! (affiliate link, I get a cut if you buy it from my link). Jim kindly invited me to take this course for free. Although I consider myself fairly knowledgeable in personal finance, I only scored 19/25 in the pre-test. It goes to show there are always something new to learn. Despite the title, the course isn’t just for people who already have a financial advisor. Nor is it about the mechanics of how to fire a financial advisor. It’s more about understanding the personal finance topics well enough so that you know what to do on your own or how to hire the right help. I see these as basically everything someone needs to know in order to manage one’s finance well in the accumulation phase. It’s especially helpful for someone who is new to personal finance. It’s also helpful to bring a spouse or significant other up to speed even when you are already familiar with the subjects. The course is primarily short video lectures. Jim teaches the subjects, sometimes with slide presentations, sometimes with live navigation of computer screens. Each section leads you to write a section of your financial plan, with examples and templates. There are quizzes and explanation for the correct answers to the quiz questions. Altogether I’d say there are over 10 hours of materials. It took me that long to finish it. You can take the course, stop at any point, or jump ahead. The course remembers where you stopped and which parts you already went through. Once you enroll, there is no time limit to finish it or how many times you can repeat it. After you go through the course, you will have a financial plan for your own situation. I wish I had it when I first started working. Jim is a doctor; I’m not. He mentions some terms specific to a doctor (resident, attending) and some situations more prevalent to a doctor (huge student loans). I don’t think those make the course any less valuable to someone who isn’t a doctor. Everyone needs a financial plan. It helps if the person taking the course has a healthy income. If someone only makes $30k a year, it’s not very realistic to maximize 401k and IRA contributions. The course costs $499. For 5 days only between March 14 and March 18, it’s discounted 15% to $425 with promo code MATCHDAY18. It provides a fast track to jump to a level where any additional personal finance topics would start to make sense. Different people learn differently. Some people prefer to read. Some people prefer to listen and watch, even if the same words in a book are being communicated verbally. Learning, and learning the right materials from the right source, are the most important. A $499 course is much more expensive than a book, but a book that doesn’t get read isn’t as effective. I also don’t know a book that covers everything in the course. Relative to being ignorant of personal finance topics and getting misled by salespeople, $499 is much less expensive by several magnitudes. On the other hand if you are already well versed in personal finance, you don’t need the course because you already have a good foundation of knowledge. In that case I see the course as a good tool to help bring a spouse or significant other up to speed. It can be especially good for a son or a daughter who will get into the real world for the first time. Jim offers a 7-day no-questions-asked refund policy. If you don’t like it ask for a refund in 7 days. There’s really no risk. If you do decide to buy the course, please use my link by clicking on the image below. A part of your purchase will support this website. The price is the same if you buy directly from Jim. So you might as well have him send some support this way. Didn’t we meet in person in 2008 in Dallas? We did? Sorry that was so long ago. Would love to meet again, maybe next year at your conference.